We wake up at 6:00 am and since it is a beautiful morning with a perfectly clear sky, we decide to stay up, get dressed and leave for another trip to the desert…. Our goal is the Salton Sea, which is way out in the Californian desert. On the way to the sea we do some off-roading again and drive along some washes and sand roads. We are not the only ones; we find a lot of campers with their ATVs (All Terrain Vehicles) and bikes. Then after about 140 miles we finally arrive a the Salton Sea: The Salton Sea, located in the southeastern corner of California, is actually a lake which occupies a desert basin known as the Salton Sink. This body of water covers a surface area of 376 square miles, making it larger than Lake Tahoe and Mono Lake. In fact, the Salton Sea is the largest lake in California. The Sea’s current elevation is about 227 feet below mean sea level, its maximum depth reaches 51 feet. The Salton Sea has a unique make-up. 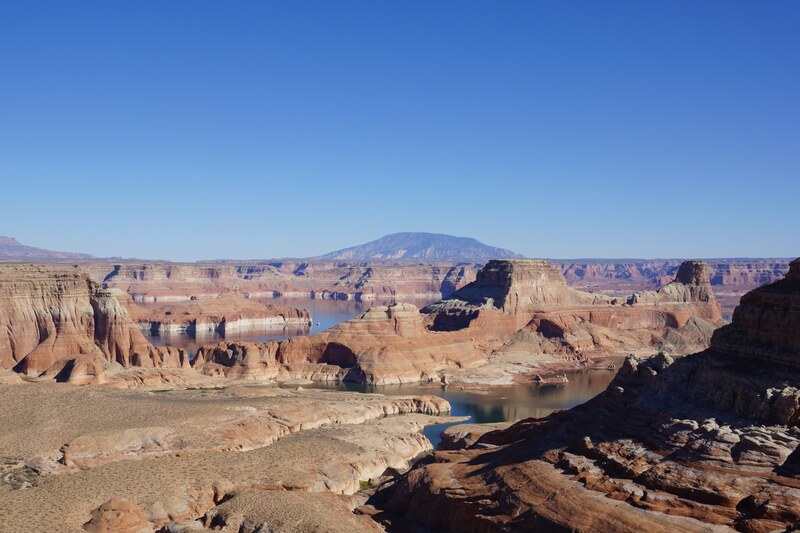 By virtue of its location in the Colorado Desert ecosystem, an area with average annual precipitation of less than 3 inches per year, the Sea receives minimal inflow from rain. As an agricultural drainage reservoir, the Salton Sea serves an important purpose for the productive agricultural valleys that adjoin it. As an agricultural sump, the Sea consists primarily of commercial agricultural drainage. In fact, 90 percent of the entire inflow to the Sea is agricultural runoff from the Imperial, Coachella, and Mexicali Valleys. This inflow carries nutrients, such as phosphates and nitrates, which support the rich and abundant life in the Sea. The inflow also carries an abundance of salt (and, thus, the Sea’s name). Currently, the salinity level of the Salton Sea is 44 parts per thousand (ppt), compared to 280 ppt for Utah’s Great Salt Lake, about 210 ppt for Israel’s Dead Sea, 87 ppt for Mono Lake and 35 ppt for the Pacific Ocean.